Go players currently meet three or four times weekly in the Research Triangle Area of North Carolina. We welcome and encourage all levels of players, from beginners to high dans. Tuesdays from 6:00 PM until 8:00 PM, the Carolina Go Club meets on the UNC campus in Chapel Hill. Please see their website for details and more info. Wednesdays from 6:00 PM until 9 PM, the Triangle Go Group meets at LiMing's Global Mart in Durham. Note: New location and time. See New Venue for details. (Occasionally -- Email for info.) Sundays starting at 3:00 PM at The Looking Glass Cafe in Carrboro. (Occasionally -- Email for info.) Mondays from 7 PM until 9 PM in the cafe at Barnes & Noble In Brier Creek Commons, Raleigh. (Ad Hoc -- Email for info.) The Cary Go Club meets on an ad hoc basis at SAS on Thursdays from 11:30 AM until 1:00 PM. See their website for details. If you know of regularly scheduled go games at Duke, NCSU or any other locations in the Triangle, please contact the webmaster if you would like those meetings to be advertised here. 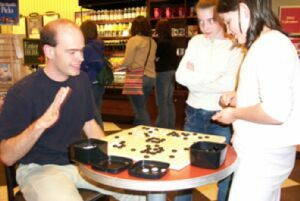 A friendly host of the Triangle Go Group is the Barnes and Noble bookstore at the Streets of Southpoint, in south Durham. We meet on Friday evenings at the Starbucks located at the north entrance to this excellent book store. 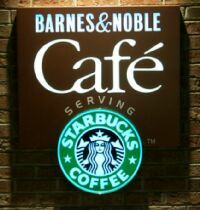 Both Starbucks and Barnes and Noble certainly deserve your patronage in return for their support of the Go community. We play Go from around 7:00 until closing at 10:00, and then occasionally relocate to a nearby vendor of adult beverages for review of games and serious scholarly discussions. 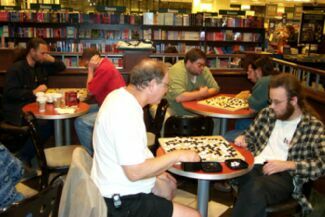 Players also occasionally gather at the Barnes and Noble Bookstore in Brier Creek Commons, in north Raleigh. Please show your appreciation for the generosity and cooperation of this fine institution by taking advantage of their eclectic inventory and buying loads of their books.